I'm not going to ask if real or fake. I will ask if they are produced by mint(s) or not? Solid silver or plated? Realistic market price? Fortunately, I own a set of High Monk Jianzhen Returning to China on Tour Exhibition Commemorative medals. My set was authenticated, graded & encapsulated by NGC in a multi-coin holder some years ago. After purchasing the original set, I have looked for a second set for my collection. Two years ago, in the Madian coin & stamp market in Beijing, I saw a silver plated set in double plastic. Last August, at the coin show in Kowloon, I saw another silver plated set in double plastic. The Beijing set was priced at $450. I did not ask the price of the set in Kowloon. Long ago, I learned to not purchase another person's problem. If you have the interest in this set at this price, contact the seller and ask them to submit the set to NGC for authentication before completing the transaction. A fair request. Coinex- why have you not sent this set in for grading? Can someone translate the 'B' and 'C' varieties? Google translate isn't clear enough. Can someone translate the full article? Bing translator (http://www.bing.com/translator/) + Google translator give a pretty good sense. Still a human translator is much better. RAREMEDAL — Feng Jingjing sir. I come from He'nan of China. I love chinese rare medals and golden and silver coins. It came in recently and we need to wait a bit more before we have enough coins to send in for a bulk submission. I would expedite the submission and ensure it is appropriately authenticated if there is a buyer interested on the forum. 10% deposit required which would only be refundable if it did not check out as expected of course. Translation: As far as I know, there are 6 types of Jianzhen commemorative medals (5 with a diameter of 30mm, the other with a diameter of 60mm). A few days ago, Mr. 玉可求 told me on QQ about the differences of the two version of 1980 jianzhen monk silver medal! 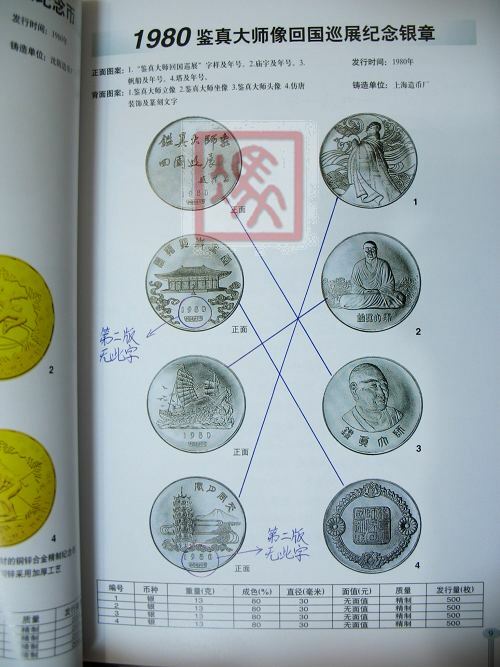 I was quite interested, so I seriously studied the "1980, monk jianzhen Silver medal" and discovered that they may have 3 varieties! I call them A,B, and C version! Let me talk about the differences between the three versions! B version: The reverse of the coin depicting Jianzhen-crossing-the-sea and the coin with the seal do not have the date "1980" and the pharse "China mint"! Other coins are the same as A version. The pictures posted by friend with the Internet moniker of "艺海" are this version! C version! : The reverse of the coin depicting Jianzhen-crossing-the-sea and the coin with the seal do not have the date "1980" and the pharse "China mint"! Furthermore, the writing on the seal is "唐鉴真回国探亲纪念" ("Commemorate the return of Tang Jianzhen") and there is a date "1980" underneath the seal. [edit: the writing on the seal of A version is "鉴真大師?回国纪念"] I have a set of this version. It was brought back from Hong Kong Coin Expositionis by Mr. 曾庆 of Shanghai Lu Gong. The seals are cracked due to aging. It is difficult to preserve them like that so I open and put them in foam capsules. Thank you SANDAC, it is a great help. The article also talks about mixed reverses as one of the photo shows, is it correct or I got it wrong? To which variety out of the 3 it refers too? You have found and sold a few plated and restrikes of pagodas, if I am not mistaken. Would you be confident enough to bid A high amount on a set with mis-matched sides? Would you be confident enough to bid this much on a set with mis-matched sides? Hippanda, I am not sure what you mean. It is from the link fwang posted earlier. Yes, that is what I am referring to. You have seen and maybe sold restrikes Pagodas? Would you be comfortable bidding on a set with mis-matched obverse and reverse, indicating that perhaps they are not original, but maybe restrikes? In the subsequent discussion, a forum member stated that B version has a different obverse/reverse pairing than the A version. The picture with 4 lines connecting the obverses and reverses is the obverse/reverse pairing of the B version. So mismatched "B" and other versions, are either restrikes or worse- copies? According to RAREMEDAL (the last sentence of SANDAC's translation)- "Of the three versions above, I only observed two in person. The first one only appears in books, whether it is real will need more insights from the forum. ..."
So there is uncertainty even about version 'A'. What about the soft pouches? Aren't early 80's coins/medals supposed to be unsealed? WOW! Asking a question got me a smite. Sorry to hear that, especially when your questions are valid. Since not much known about these medals and they are not seen for sale often it is reasonable to ask these questions. There are evidences of few varieties including silver plated sets and not much clear and solid information that can be used to determine what is real, fake, re-strike or even what is the official mint release looks like. Not long ago the same questions were asked in previous thread before there was any set offered for sale on eBay. IMO, "coinex" listed set is "A" version mentioned in RAREMEDAL's article, with identical design to the original as shown in the attached pictures. NGC or PCGS can determine if this is 80% silver or plated by testing its specific gravity. A silver plated variety is auctioned on Zhaoonline. Auction ends on Feb-15. "Our sources at the mints have told us that this set of 1980 in silver was re-struck in 1992 in silver plated brass at a satellite office in Shanghai. There are many satellite offices that mint products officially for the Shanghai Mint but many others mint stuff without permission from the mint due to no regulations. NGC has been very careful accepting these kinds of products for grading." "Yes. The Shanghai mint has many times used other smaller minting offices to fulfill orders. These satellite offices can also mint for private use with or without the permission of the Shanghai Mint. There is no regulation or at least at that time. More than likely there would be no COA on these but not sure 100%. NGC in this case would require a COA so we know it is a legit medal from a Shanghai Mint product. There are so many medals that are privately issued and it gets really confusing for us to determine what is a legit project from the Shanghai Mint. This is why we really need verification from a COA." Was this set graded under year 1980? Hmm. Nevermind. I finally got it shown up in the census. Sharing plated and opening to discussion. All 4 have straight reeded edge. All 4 have diameter of 30mm and 2mm thickness. The table poconopenn posted above showed the silver version has 80% fineness which should have a relatively muted appearance whereas these pictures are very bright like silver plated coins, just as you've indicated. So version B is a silver plated version then? Do you know whether NGC will grade this set? Edit: I looked at the table from poconopenn again and just realize something doesn't quite added up: The "Pure Silver Content (g)" is stated as 11.747g but "Weight (g)" is 12.7g, so fineness should be 11.747/12.7=92.5%. "Fineness" is stated as 80%. That doesn't compute. I do not know if NGC will grade this set. As you can see, they are not in the best condition. Hate to waste the time and dollar on items of these condition. I am looking for a plated in top condition. Actually I thought the coins look really good. The sailing ship seems to have scratches, but then it could also be byproduct of silver plating process. Silver plated coins of that vintage seldom receive PF69 grade. PF68 is an excellent grade for silver plated. The red book suggests the weight of this medal is 13 gm and silver content is 80%, while Mr Ge's book also suggests the weight is 13 gm, but no silver content is mentioned. From Max Spiegel of NGC "Thanks for the question. We do not currently certify these medals." My question was regarding silver plated medals. I have seen a "mixmatched" reverse set in person & passed on it due to, never being aware of it. What did it sell for??? ⓘ Ask us your pricing questions! All 4 have smooth edge. All 4 have 30mm diameter and 2mm thickness. All 4 have straight reeded edge. All 4 have 30mm diameter and 2mm thickness. All 4 have ??? edge. All 4 have 30mm diameter and ?mm thickness. Thanks for sharing. Is the first set gold plated or brass? I believe it's plated; not sure. Here are hi-res pictures. No images and "Total Graded at" is blank. According to Max Spiegel of NGC from last year March, NGC does not grade plated. Hmm. Thanks for the high res pictures. Due to the lighting, I still cannot conclude whether it is gold plated or brass. But the numerous dots on the surface resemble those on my brass set. I have not seen any gold plated version, though. I will ask those in China to give their opinion.